dogsandducksuk has no other items for sale. Product as described by the buyer. ***** seller. Arrived quickly, goods as described, no problems. Easy transaction, all good. Item arrived safe and sound. Thank you. had to pay 3 pounds to post office and collect it. postage was underpaid. why? Good quality strong tape, great for use at work and on on film shoots. 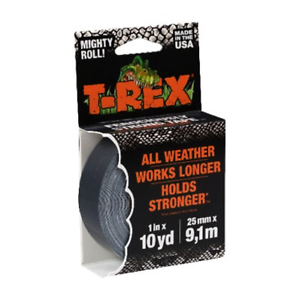 Used T. rex tape now on various applications. And it hasn’t let me down. Holds out the water on my convertible roof. Just like the good old gaffa tape from days gone by. Strong tape, but make sure you get the right width, 25mm is not the size on the TV advert!